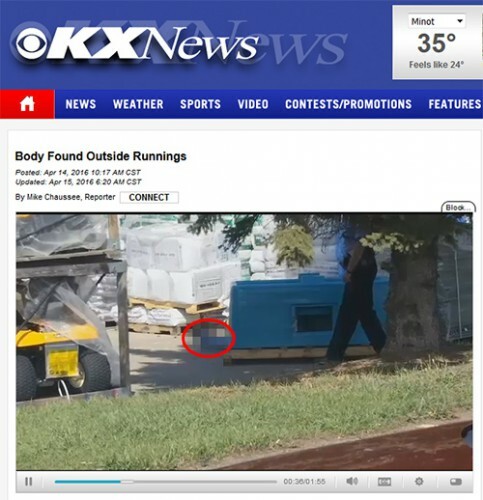 I noticed some outrage on social media yesterday about the fact that KXMB was showing the feet of Bismarck-Mandan’s latest murder victim, pictured at the scene of the crime. Upon reviewing the news story myself I also noticed a shot that looked like it was a little too Peeping-Tom for my tastes. It looked as if the KX crew was trying to shoot between pallets and get video of the officers checking out the body. 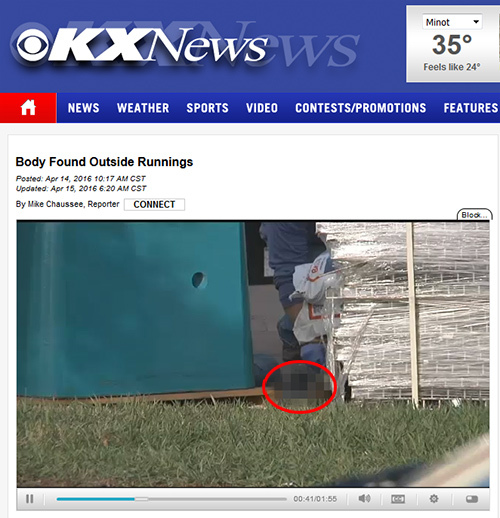 As KXMB guest anchor Ron Burgundy would say, “Stay Classy, KX News”. This is no departure from a long legacy of ambulance chasing at KXMB. I’ve written about it extensively before as one instance of this behavior caused a great deal of pain for my extended family. How’d you like to find out your son is dead because it was on Channel 12? The fact of the matter is that to anyone who knew the victim, especially those close to her, those aren’t feet. They are HER. DEAD. Is branding that image into the minds of people who are now grieving the loss of a loved one worth whatever feather KX News feels is placed in its journalistic cap? The first time I pointed this out got me a call from a former KX news personality who was all lawyered up and demanding that I take any criticism off the Internet (as if anything can be removed from the world wide web). The second time I pointed this out my blog was removed from the KX Net’s websites, who were syndicating it with my permission. Apparently they couldn’t take any open scrutiny of their news practices. When I worked at KFYR-TV the employee manual stated that any sensationalism in the news would not be tolerated. Nobody had to tell us that; it was a matter of professionalism. It was reinforced in writing and in detail when an out of state company bought the Meyer Broadcasting stations. Maybe the out of state company that bought KXMB should put a lid on irresponsible behavior like this. The new crime “reporter” at the Bismarck Tribune is SO bad. Says she came from the Marshall Project “a creative newsroom dedicated to covering criminal justice, founded on the belief that honest storytelling can bring about social change.”…Caroline Grueskin studied ethics and moral philosophy at Stanford University. Might say it all. She appears to be a reporter from the National Enquirer, not the Bismarck Tribune. Read her stories too then do some research.